^ Cooper, Tom and Juan Sosa. Coup Attempt, 1992”. Air Combat Information Group (ACIG), 1 September 2003. Retrieved: 16 May 2008. ^ Anon. "F-16 Aircraft Database: F-16 Airframe Details for 86-0262". F-16.net. Retrieved: 16 May 2008. ^ Anon. “Greek & Turkish Air-to-Air Victories”. 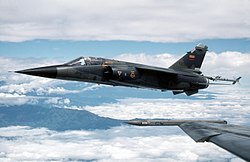 Air Combat Information Group (ACIG), 28 October 2003; updated 18 September 2004. Retrieved: 16 May 2008. ^ Dewitte, Lieven. “Deadly 1996 Aegean clash is confirmed”. F-16.net, 22 May 2003. Retrieved: 16 May 2008. ^ “Greek F-16 and Turkish F-16 collide - 1 pilot OK”. F-16.net, 23 May 2006. Retrieved: 16 May 2008. ^ Graham Warwick (1991-12). “A Fighting Cahnce”. Flight International: 26. http://www.flightglobal.com/pdfarchive/view/1991/1991%20-%203220.html 2013年8月21日閲覧。. ^ Simon Elliott (1990-07). “After ATF...”. Flight International: 145. http://www.flightglobal.com/pdfarchive/view/1990/1990%20-%202655.html 2013年8月21日閲覧。. ^ Italian F-16 'Peace Caesar' program comes to an end. F-16.net, 24 May 2012. ^ F-16.net Tayeset 140 (IDFAF) "Golden Eagle (Nesher Ha' Zahav)"
^ F-16.net Tayeset 119 (IDFAF) "Bat (Ha' Atalef)"
^ F-16.net Tayeset 107 (IDFAF) "Knights of the Orange Tail (Ha' Rosh Ha' Aryev)"